United Airlines announced it has installed 20 BorderXpress automated passport control kiosks, developed by the Vancouver Airport Authority (YVR), in the Terminal C customs hall at Newark Liberty International Airport. The new BorderXpress APC kiosks will help facilitate a quicker, more customer-friendly experience when United customers enter through U.S. Customs and Border Protection services, by enabling them to scan their passport and fill out their customs declaration before they interact with a CBP officer. The kiosks, which were developed by YVR in partnership with U.S. Customs, expedite the customs process by drastically cutting down on wait times and speeding up the screening process by an average of 89 percent. When using the kiosks, customers will be asked to follow on-screen instructions to ultimately receive a notification slip that validates their identity and flight detail, which they will then bring to a CBP officer, along with their passport, to be processed. Over the past year, United has already installed several APC kiosks at its hubs in Chicago and Houston, with additional plans to install 10 more units at Newark Liberty in the weeks to come. United is offering the complimentary service to all international travelers with a U.S. or Canadian passport, without the need to go through any pre-registration process. Previously reported by BiometricUpdate.com, the Vancouver Airport Authority upgraded its BorderXpress kiosks, with new biometric technology from Cross March that enables international travelers with Electronic System for Travel Authorization approval to use BorderXpress. 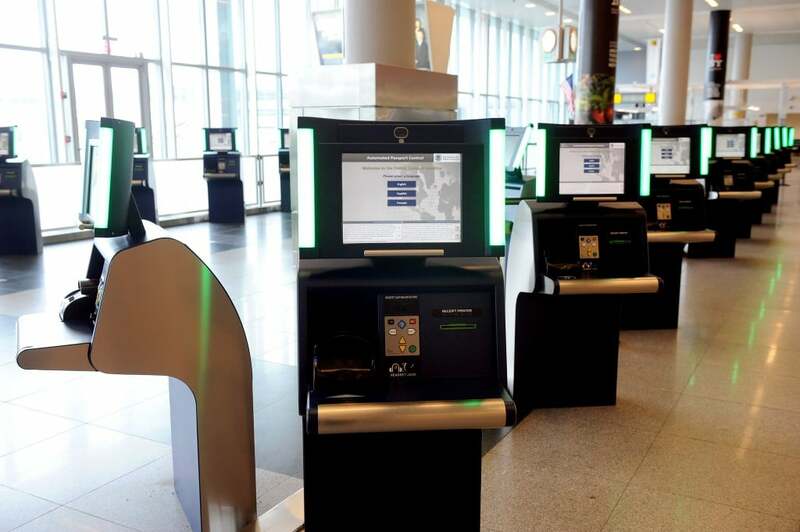 United Airlines Installs 20 BorderXpress Automatic Passport Conrol Kiosks at Newark Liberty.